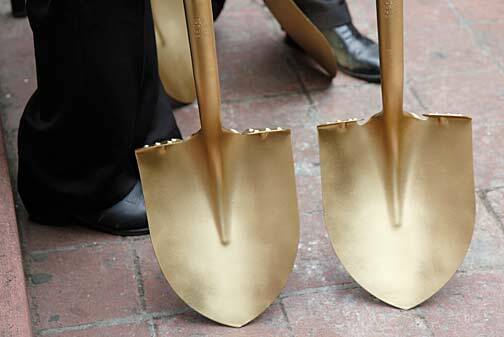 Golden shovels used at the Sept. 8, 2010 groundbreaking ceremony for the Siqueiros Mural and Interpretive Center on L.A.'s historic Olvera Street. Photo by Mark Vallen ©. 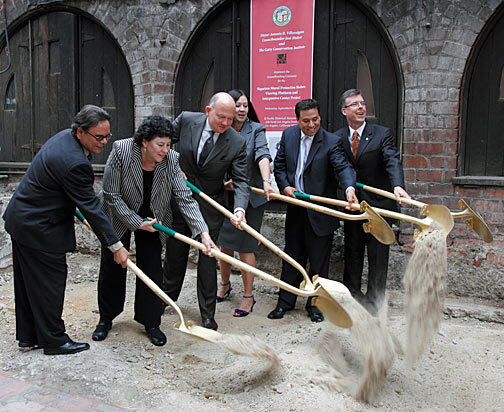 The construction of the Siqueiros América Tropical Mural And Interpretive Center on Olvera Street in downtown Los Angeles grows ever closer. Carol Jacques, Commission Vice President of the El Pueblo de Los Angeles Historical Monument Authority, invited me to attend the historic groundbreaking ceremony for the Interpretive Center that took place on September 8, 2010, and as someone who has been writing in-depth coverage on this story for years, it was an opportunity I could not pass by. At 10 a.m. I arrived at the Avila Adobe House on Olvera Street for the scheduled press conference, and found the bungalow filled to capacity with L.A. City government officials, Getty museum functionaries, foreign dignitaries, art aficionados, news media, and many of those who have worked so diligently over the decades to “bring Siqueiros back” to Los Angeles. 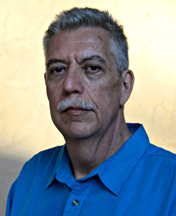 The Director of the Getty Conservation Institute, Timothy P. Whalen, at the press conference held at the historic Avila Adobe House, just prior to the groundbreaking ceremony. Photo by Mark Vallen ©. Featured speakers who addressed the press conference included the Director of the Getty Conservation Institute, Timothy P. Whalen, and Los Angeles Councilmember José Luis Huizar. Both gave short speeches on the history of the mural, the status of the Interpretive Center project, and their belief that the center will enrich the cultural and intellectual life of Los Angeles. The setting for the press conference was the aforementioned Avila Adobe House, the oldest house in the city of Los Angeles. It was originally constructed in 1818 by Don Francisco Avila, who was the Mayor of El Pueblo de Nuestra Señora la Reina de los Angeles (The Town of Our Lady the Queen of Angels). The stucco-clad adobe dwelling was erected before the United States invaded Mexico, forcing it to cede California, Nevada, Utah, Texas, and parts of Arizona, Colorado, Oklahoma, New Mexico, and Wyoming to the U.S. in 1848. The adobe also stood before Mexico won its Independence from Spain in 1821. I was overwhelmed thinking that the house made from sun-dried bricks of clay and straw, a building that had seen so much history, was now the setting for a press conference announcing the construction of a 21st century interactive arts center. 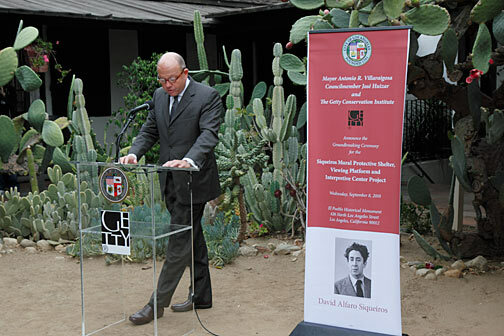 After completion of the news conference, the assembly was invited to move to the adjacent Italian Hall, where the rooftop Siqueiros mural is located and where the actual groundbreaking was to occur. An air of expectation grew as the crowd gathered on the steps of the old Italian Hall, waiting for the historic groundbreaking ceremony to begin as photographers jockeyed for position. In due time representatives of the Getty Center, along with members of L.A.’s City government, took their golden shovels in hand to enact the symbolic breaking of the ground. With that emblematic gesture, cheers of approval and applause rose up from the crowd, and construction of the Siqueiros América Tropical Mural And Interpretive Center was at last underway. After the groundbreaking ceremony the media and the public were invited to the rooftop of the Italian Hall to view the current state of the mural project. Due to the precarious condition of the old building, city workers would only allow 25 people at a time to visit the roof, but the wait was worthwhile. 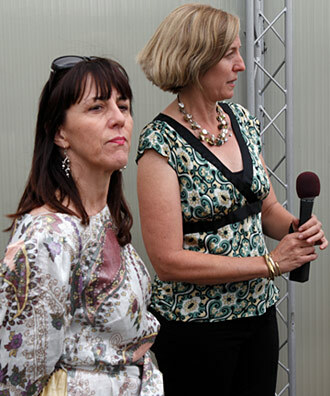 Susan Macdonald, Head of Field Projects for the Getty Conservation Institute, and Leslie Rainer, Senior Project Specialist for the Getty Conservation Institute, greeted those who climbed the stairs to the rooftop. The two lectured on various aspects of the project, and with great enthusiasm answered all questions pertaining to the mural venture. Presently the mural is protected from top to bottom by a metal screen and supporting armature. City officials and Getty staff both made assurances that the project would be completed and ready for public unveiling by the end of two years time. 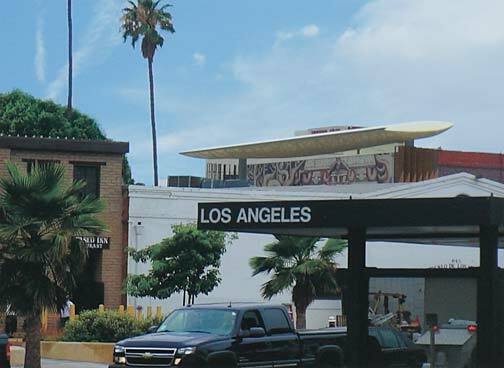 Rendering of the Siqueiros mural shelter as seen from Union Station. Image courtesy of Pugh + Scarpa Architects ©. When Siqueiros came to L.A. in 1932 as a political refugee, the U.S. was in the throws of the Great Depression. Millions of people were out of work and had lost their homes. The government was involved in the mass expulsion of up to one million people of Mexican descent, including tens of thousands of U.S. citizens; Los Angeles County alone deported up to 80,000 people to Mexico, many of them apprehended on or around Olvera Street and its environs. In 1936 the Spanish Civil War was the opening salvo of what would become WWII. Such matters were surely on the mind of the artist when he painted his mural works during his six-month long exile in L.A. 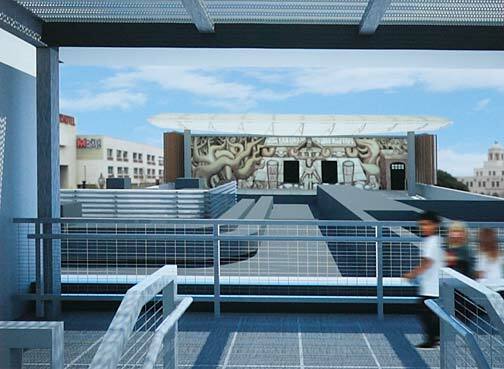 Rendering of the Siqueiros mural shelter from the viewing platform to be constructed atop Italian Hall. Image courtesy of Pugh + Scarpa Architects ©. As Siqueiros’ América Tropical mural is being reborn on Olvera Street in the early 21st century, the U.S. is in the grip of unemployment rates the likes of which have not been seen since the Great Depression. Millions of people have lost their homes, city budgets are collapsing and social services are being cut to the bone. Hatred of immigrants is rampant and escalating, and the nation is fighting multiple foreign wars; which is to say, the present political landscape bears an eerie resemblance to the 1930s. The question is not how David Alfaro Siqueiros would react if he were alive, the question is - how will today’s artists respond to the mounting social crisis.